In our previous note Amalgamated products and HNN extensions (IV): Markov properties, we saw that for every and for every finitely-presented group , there exists a -dimensional closed manifold whose fundamental group is . However, such a result does not hold for ; for the case , see for example the note On subgroups of surface groups. The present note is devoted to the 3-dimensional case . In particular, we will prove that the groups for , for , and for are not 3-manifold groups. 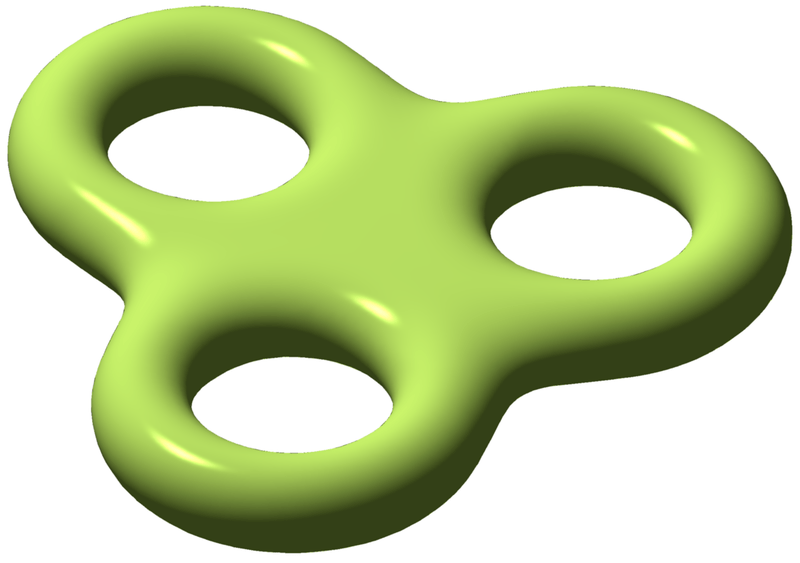 Definitions: A handlebody of genus is an orientable 3-manifold (with boundary) obtained by attaching “handles” to a 3-ball. Roughly speaking, it is a full closed surface of genus . A way to construct 3-manifolds (without boundary) is to glue two handlebodies and of some genus along their boundaries by a homeomorphism . We say that the triple is a Heegaard splitting of genus of the resulting manifold. Theorem 1: Every closed 3-manifold admits a Heegaard splitting. Notice that, if is the graph whose vertices are the centers of the 3-simplices of and whose edges link two vertices corresponding to adjacent 3-simplices, then may be thought of as a neighborhood of . Therefore, we have proved that is the union of two handlebodies which intersect along their boundaries. To conclude, we need to argue that and have the same genus, or equivalently, that . where (resp. ) is a generating set of (resp. ). Corollary 2: Every 3-manifold group admits a balanced presentation. So, a natural question is: which groups admit a balanced presentation? In fact, this question is linked to (co)homology of groups, which we define now. A space is aspherical whenever for all ; according to Whitehead’s theorem, it amounts to require the universal covering to be contractible. 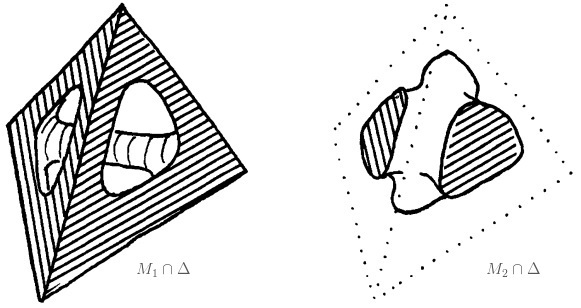 An interesting property of such spaces is that they are uniquely determined, up to homotopy, by their fundamental groups, that is to say, two aspherical spaces are homotopy equivalent if and only if their fundamental groups are isomorphic. Given a group , a space or a classifying space for is an aspherical space whose fundamental group is isomorphic to ; according to our previous remark, such a space is uniquely determined by , up to homotopy. In particular, this allows us to define the -th (co)homology group of as the -th (co)homology group of such a classifying space. In order to justify that (co)homology groups are always defined, we need to prove that every group has a classifying space. First, to a given presentation of we associate a two-dimensional CW-complex as follow: Define as a bouquet of circles, each labelled by a generator of . Then, for every relation , glue a -cell along the path labelling by . Using van Kampen’s theorem, it is not difficult to notice that the fundamental group of our complex is isomorphic to . However, it may not be aspherical. Now, let us define an increasing sequence of CW-complexes such that and for all (such a sequence will define a Postnikov tower). The spaces are defined inductively in the following way: Let be a generating set for ; then, define by gluing -cells to using the . By construction, , and we claim that the embedding is -injective for all by cellular approximation. Finally, let . By construction, is aspherical, and because have been constructed just by gluing -cells to with , we deduce that (since the fundamental group depends only on the -skeleton of a CW-complex). Therefore, is a classifying space of . For more information on Postnikov towers, see section 4.3 of Hatcher’s book, Algebraic Topology. Theorem 3: Let be a presentation of a group with and . Let also denote . Then . Proof. Let be the CW-complex associated to the given presentation. According to what we have said above, we may add -cells to , with , in order to “kill” higher homotopy groups, ie., our new CW-complex is aspherical. Moreover, because we did not modify the -squeleton of , is isomorphic to . Therefore, is a , hence . Corollary 4: If a group admits a balanced presentation, then . Thus, now we have a necessary criterion to determine whether or not a group admits a balanced presentation. The Proposition below applies this criterion to the right-angled Artin groups (we defined them in our previous note Some SQ-universal groups). Proposition 5: A right-angled Artin group admits a balanced presentation if and only if has more vertices than edges. Sketch of proof. To the canonical presentation of is associated a cube complex , called Salvetti complex: has only one point, one edge for each generator of , and generators span an -cube if and only if they pairwise commute. Now, it can be proved that the Salvetti complex is nonpositively curved so that its universal cover is CAT(0); because a CAT(0) space is contractible, we deduce that is a classifying space of . Moreover, it is not difficult to prove that the -th homology group of is free on the set of -cubes. Therefore, corresponds to the number of vertices of , and to its number of edges. Thus, if admits a balanced presentation, according to Theorem 3, must have more vertices than edges. The converse is obvious. For more information on CAT(0) geometry, see Bridson and Haefliger’s book, Metric spaces of nonpositive curvature. Now, we are ready to prove that the groups mentionned at the beginning of this note do not admit a balanced presentation, and thus are not the fundamental groups of closed 3-manifolds. Corollary 6: Let . Then admits a balanced presentation if and only if . Proof. is the right-angled Artin group associated to the complete graph . Because has vertices and edges, it is sufficient to apply Proposition 5 to conclude. Corollary 7: Let . Then admits a balanced presentation if and only if and or and . Proof. is the right-angled Artin group associated to the bipartite complete graph . Because has vertices and edges, it is sufficient to apply Proposition 5 to conclude. Corollary 8: Let . Then admits a balanced presentation if and only if and or and . Proof. Let denote the graph with vertices and no edges. Then is the right-angled Artin group associated to the join . Because has vertices and edges (here, we suppose ), it is sufficient to apply Proposition 5 to conclude.